Empower youth and their communities through education. We provide innovative learning tools, laptops, connectivity, learning models,opportunities to learn everywhere, every day. Connect children to US peers via environm﻿﻿ental learning curriculums and games. We partner with One Planet Education, http://oneplaneteducation.com, and their endangered species games. Learn more about our Connecting Kids Series. Invent & Learn Newest Program in Development for 2016 at the Makini School Donate to provide this program to many children. More than just providing learning devices, we are builder inventors, problem solvers, students who know how to use tools to make something. 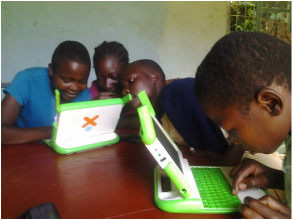 Kenyan children should not become consumers of technology, but makers. David Muya, passionate award winning teacher, uses technology to engage students in projects where they learn how to address the problems of the world around them. Small Solutions Big Ideas and TEC Kenya are partnering with the Makini School where teachers value real learning. Small Solutions Inc. is a 501c3 Corporation, registered in the Commonwealth of Masschusetts. All donations are tax decuctible.